The first travel tip to keep in mind when you are planning to rent a campervan in Iceland is road condition. There is one road, Route 1, the Ring Road which circles the entire country, a distance of just under 1,400 km. It connects the main populous areas and has many worthy sights along the way. Other roads are smaller and mountain roads are open only from June to October, other times being too muddy. Iceland is equipped with holiday parks and caravan and camping sites that accept motorhomes, campervans and recreational vehicles (RV). You can go online and reserve your Iceland campervan hire or motorhome rental before you travel, then pick up the keys from your Iceland motorhome hire, campervan and RV rental Iceland depot on arrival. It is good advice to plan ahead and book in advance, as the demand for RVs can be high. Do take time to check what the driving conditions will be at the locations you plan to visit. Reykjavík is not only the capital of Iceland, but the capital of fun…quite literally. After a day of sightseeing, book at table at the Reykjavik Restaurant and Ice Bar; the bar is a large room made entirely of ice that you can only stay in for a short time before it becomes too cold! Follow with a fish dinner at the restaurant. Pay a visit to the Blue Lagoon; here you can spend a day relaxing with water treatments, massages, refreshing waterfall, geothermal steam bath and sauna, and Blue Lagoon silica mud masks. 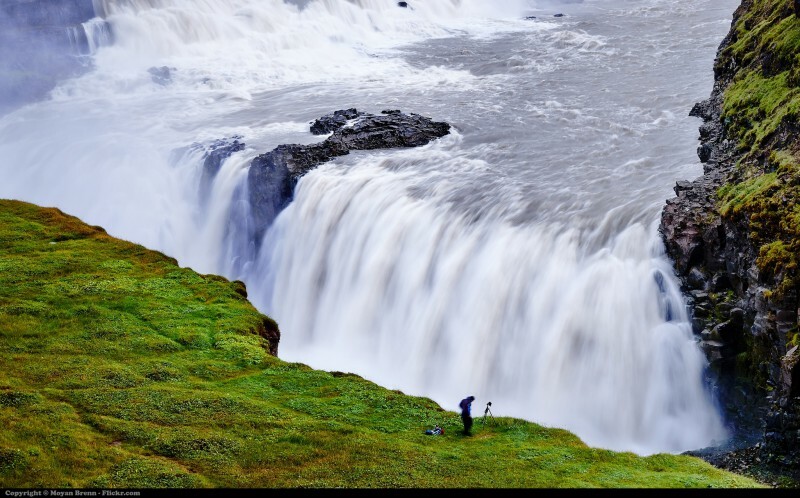 One of the most popular attractions in the whole country is Gullfoss (Golden) Waterfall. They say there are no words or photographs that and do it justice; it is a must-see on any Iceland motorhome rental holiday. This river originates at Langjökul glacier, one of many stunning glacial spots. When the conditions are right it is possible to see the Aurora Borealis (Northern Lights) due to Iceland’s proximity to the Arctic Circle. From May until August you can experience the “midnight sun”, with daylight round the clock – yes, all 24 hours – as the sun never quite dips below the horizon. Iceland is also one of the most volcanically active countries on earth. Because of this you will be treated to other such natural wonders as blue geysers, sulphur vents, black lava fields as well a rolling green valleys and fjords. The east and west regions are for fjord followers; north Iceland is where you will be amazed by cascading waterfalls and black lava fields; finally, the central region is covered with glacial mountains. The population mostly resides along the coast, specifically along the aforementioned Route 1. If you would rather get a bit lost and explore your way back to Reykjavik or Keflavik airport, most Iceland campervan rental and motorhome hire branches will allow you to return your hire RV at another major city location, allowing you to maximize your time by avoiding having to make a return trip to your starting location.